So let’s start with the Richter scale, which is the obvious one everyone thinks they know about. The Richter scale operates on a logarithmic scale, which is a method of measuring quantities that increase exponentially while keeping them all on the same piece of graph paper – or in this case, on the same ten point measurement device. This means that each point on the Richter scale represents an increase of ten times the power of the previous point on the scale; an earthquake measuring 3.0 on the Richter scale is ten times more powerful than one which measures 2.0, and a hundred times more powerful than one which comes in at 1.0. 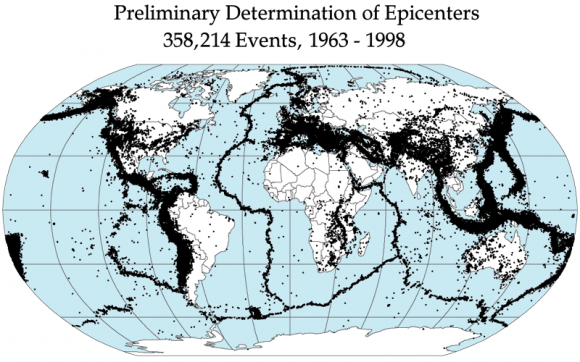 It’s this measurement quirk more than anything else that leads to most local reported earthquakes coming in at around the 4.0—5.5 mark, since the scale has to cover the entire range of possible earthquakes from tiny microtremors to vast world-ending ruptures in the earth’s crust. 4.0 is the point at which earthquakes become noticeable by the majority of humans, and at 5.0 they start causing minor property damage; these sound like large numbers on a ten point scale but you have to remember that even a 5.0 earthquake is a thousand times less powerful than the 8.0s which cause tsunamis and kill thousands of people in places which are – hopefully – a long way away. Anyway, what you should take away from this is that the first six points on the Richter scale represent comparatively weak earthquakes that have little chance of killing anyone; the news reports are usually just quoting them to make them seem bigger than they really are. The lethal stuff doesn’t really start until after 6.0, and the good news is that you only tend to experience one of those if you live in close proximity to a tectonic plate boundary. I would also draw your attention to the final point on the conventional Richter scale – 10.0 – which says that an earthquake of this magnitude has never been recorded. That’s not to say it can’t happen, just that it would take something rather extraordinary to prompt that sort of geological upheaval, like the earth being walloped by a bloody great asteroid. We don’t notice earthquakes below 4.0 and the range of known earthquakes only goes up to 9.9, so as far as most people are concerned the Richter scale actually operates between 4.0 and 9.9, and suddenly your local earthquake measuring 5.1 on the scale doesn’t really seem like all that much. Then there’s the Volcanic Explosivity Index, which works much the same way as the Richter scale (except at lower bounds between 0 and 3 due to the way low-end volcanic eruptions work) except it measures the quantity of volcanic ejecta rather than the amplitude of the shockwaves passing through the earth. The difficult thing to get your head around here is that the VEI measures things in terms of volume, and it can be quite hard for the human mind to comprehend just how large a cubic kilometre of ash really is. It’s one of the questions of scale that often trips up undergraduate physicists, actually1: how many cubic metres go into a cubic kilometre? The answer isn’t a thousand, as a lot of people think; it’s actually one billion, which is a very large number of cubic metres indeed. Now, unlike earthquakes volcanoes are usually only locally devastating in the short-term, which is one of the reasons why the VEI is focusing on the amount of ejecta – or in other words, the amount of ash – they release. Not only is this a handy way to rank the violence of a given volcano’s eruption, but it’s the ash and gas output over the long-term that will do the major damage on a global scale. 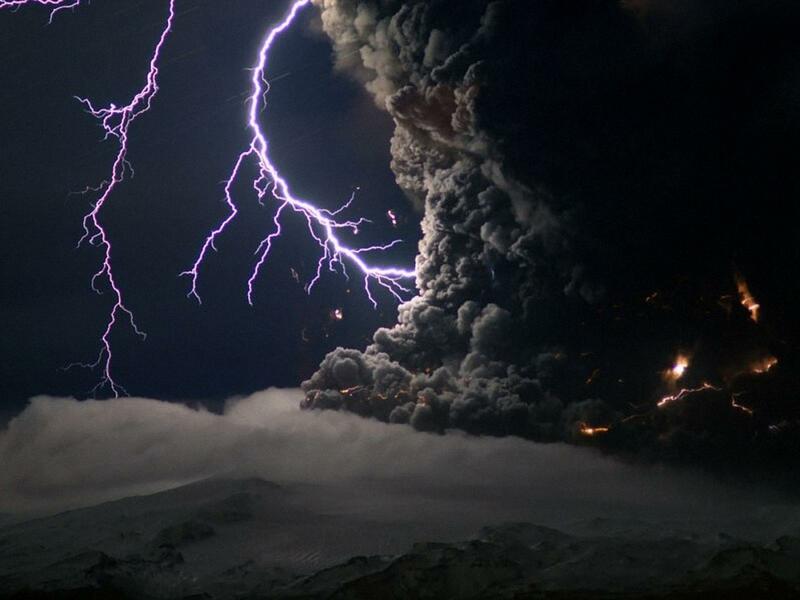 Eyjafjallajokull shut down all flights over Europe with its ash when it erupted in 2010, and that ranks at a relatively titchy 4 on the Volcanic Explosivity Index with 0.1 cubic kilometres of ash output. Krakatoa in 1883 turned the skies around the world an attractive shade of blood red and dropped global temperatures by a full degree Celsius – and Krakatoa only comes in on the VEI index at six out of eight. Once you get out to eight out of eight – the so-called supervolcano eruptions of Yellowstone and Toba, each spewing out over a thousand cubic kilometres of material – you start to see why volcanic eruptions can be globally threatening events. Both Yellowstone and Toba spread so much ash into the atmosphere and onto the Earth’s surface that not only was there a significant drop in the global temperature for years afterwards, but the human, animal and plant populations of the world started to suffer mass dieoffs as the ash either polluted their food/water sources or made it impossible to get enough light to grow. There’s even a theory that posits Toba was responsible for reducing the human race to just a few hundred living individuals, which is why the seven-billion-odd modern humans are descended from a relatively small number of ancestors. 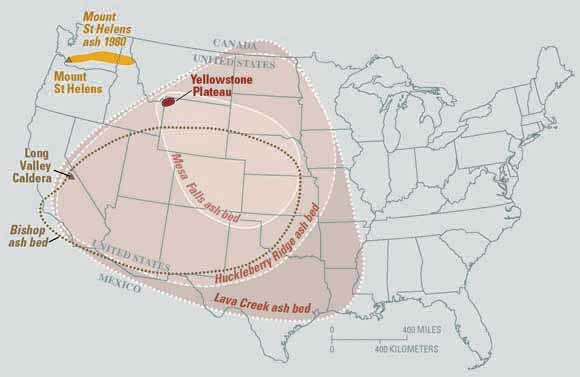 Personally I think this is just a little bit too sensational, but it’s inarguable that supervolcano eruptions on this scale would seriously mess up civilization as we know it. Finally there’s the Torino scale, which is used to rate asteroid impacts. 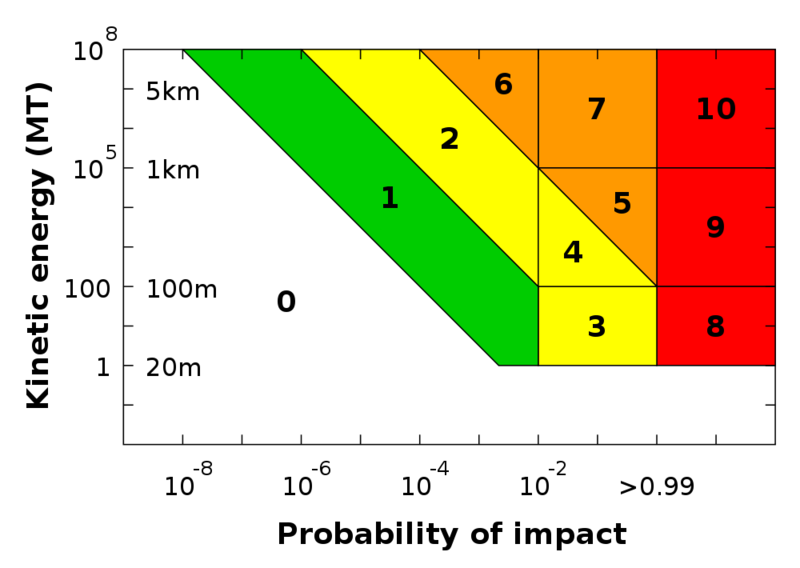 Given that the vast majority of asteroids tend to miss the Earth completely, the Torino scale differs from the others in that it combines both the potential magnitude of the impact event with the probability that the asteroid will actually hit the Earth to produce a single number that indicates just how much we should be worrying about it. Small asteroids that will definitely hit us but will burn up in the atmosphere rank in low positions on the Torino scale. Large asteroids that could explode a small country but which have low probabilities of impacting are also ranked in low positions on the Torino scale. It’s only a combination of a (reasonably) large asteroid and high probability of impact which results in an asteroid having a Torino number attached to it which is larger than one, and if you look at the chart it is impact probability which is the dominant factor in an asteroid managing to place on the higher regions of the scale. Which is fair enough, really; an object with a 1% chance of impact is something we should definitely keep our eye on, but until we get improved observations of its trajectory and know for sure it’s not a huge worry unless it’s something large enough to potentially end all life on Earth. But what about the upper regions of the scale? It’s the last three points we should really be interested in, which represent certain impacts with increasing levels of destructiveness. Number 8 is localised destructive potential, which basically equates to the detonation of a large nuclear weapon – annoying if you happen to be standing nearby, but not unduly threatening to everyone else. Number 9 represents regional destructive potential, which is… hmm. If it was an ocean impact we’d probably be talking about something on the level of the 2004 or 2011 tsunamis, but I’m not sure there’s a good analogue for a land impact. Earthquakes don’t really translate that well into asteroid strikes, but maybe just imagine a similar level of devastation to one which wrecks an entire country (so Haiti 2010, Lisbon 1758 etc.) and you’d have some idea of the amount of damage we’re talking about. And then there’s a Torino number of 10, which has the interesting wording of global climactic catastrophe. An asteroid that ranks at 10 doesn’t have to be large enough to kill millions of people through direct impact damage (although it probably would just as a byproduct), it just has to be able to throw up enough impact debris to cause mass species dieoffs similar to a supervolcano (or a nuclear winter). Now, if you ask me there should be a number beyond 10. An impact of 10 on the Torino scale is small enough that it still leaves a fair chance of survival for the human race, albeit with vastly reduced numbers. If there was an impact event powerful enough to crack the earth’s crust open there’d be no survivors whatsoever, so maybe there should be a number 11 in its own category of “WE’RE SO SCREWED”. On the other hand the Torino scale exists to communicate information to the public and I suspect the public would find the existence of this category profoundly depressing, so perhaps it’s for the best. Can you go into more detail about cracking of the earth’s crust? What kind of energy are we talking about here (minimal amount to actually crack the crust.) Also, what would be the effects of this? Is the damage from the cracked crust the main concern or is it just that anything powerful enough to have that effect would take it over the threshold of total annihilation? I don’t have access to my science stuff at the moment so I can’t look up the specific energy, however: nobody really knows what sort of direct damage a serious asteroid impact would do to the biosphere, although if it’s powerful enough to crack the crust you can bet on a significant chunk of the Earth’s population dying out anyway thanks to shockwaves, tsunamis etc and the subsequent starvation as food sources wither and die and modern civilization collapses under the strain. However, what is absolutely certain is that an impact powerful enough to crack the crust would have the knock-on effect of making every single volcano on the planet erupt at the same time. This sort of dramatic geological upheaval would release far more harmful material into the atmosphere than the asteroid impact itself, and so even if the majority of the Earth’s surface remained unscathed after the impact it’d be turned into a rather poisonous and uninhabitable place for several million years. Nobody is getting out alive after that.